Even if you, or perhaps a player you staked, didn’t make the World Series of Poker Final Table you can still have a horse in the race if you want to lay a wager on who the eventual champion will be. One of the Best Online Betting Sites has put up the odds for each of the final 9 players left in the WSOP. The odds for the November Nine range from 6/4 for chip-leader Jonathan Duhamel, to 15-to-1 for Short-Stack Jason Senti, at Betfair.com. The only odd wagers are the over-priced Mizrachi (remember Phil Ivey in a similar position last year), and the terrific value on Jason Senti, who is a top online poker pro and BlueFire Poker instructor. Yes, Senti is extremely short-stacked, but a single double-up, or a few blinds and antes and he’s near 20 million chips just like that! Another good value pick would be John Racener, who despite his youth is already a seasoned and accomplished tournament pro. 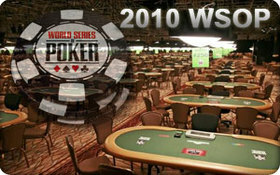 This entry was posted on Wednesday, July 21st, 2010 at 11:54 am and is filed under Poker News. You can follow any responses to this entry through the RSS 2.0 feed. You can leave a response, or trackback from your own site.